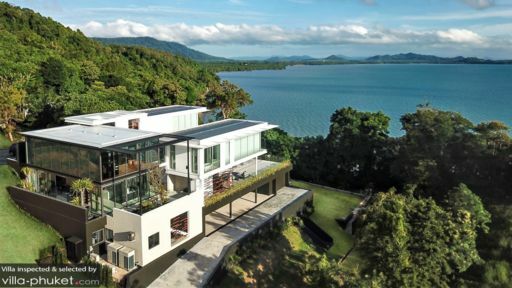 A luxury home perched on the hills of Phuket, Villa Assava is part of the prestigious Baan Yamu Estate featuring exceptional amenities, quality living, and spectacular ocean views. Amid the sun-kissed skies and vast natural scenery, the villa is breathtakingly beautiful and exquisitely designed. 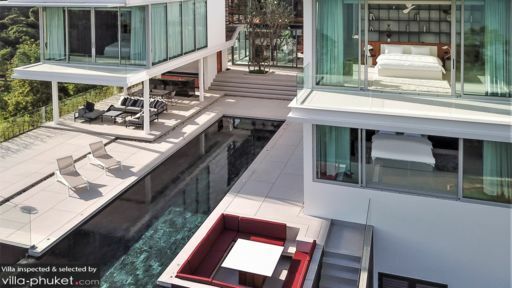 From its infinity swimming pool and sunken sala to the alluring interiors, the villa delivers on all points. The five bedrooms are housed on the three levels of the villa – the upper floor, pool level, and a lower level. Phuket is home to some of the most striking white-sand beaches and you have the advantage of location on your side! The five bedrooms at Villa Assava are designed to occupy each floor so the entire property is made good use of. Maximising on space, the two master bedrooms are located on the top floor. Featuring clean and elegant design, the air-conditioned master bedrooms are minimal and chic with king beds, a balcony overlooking spectacular sea views and the sunset and a 55-inch TV. The ensuite bathrooms are equipped with freestanding bathtubs, rain showers, and other amenities. Two ensuite bedrooms are located right off the swimming pool with doors leading directly to the deck. They are furnished with king beds and 55-inch TV with surround sound. The last bedroom is located on the lower level alongside a spa that can be used as an additional room. Tropical modernity at its absolute finest, Villa Assava features a 17-metre infinity swimming pool with Jacuzzi that overlooks sweeping views of the ocean, vast skies, and neighbouring verdure of the greenery. Right beside the pool, you have an arresting red sunken lounge with comfortable seating perfect for sunset drinks. The sun deck is where the magic happens with alfresco dining for eight, seating area, BBQ grill, and a bar. You have access to a powder room and an outdoor shower for your ease as well. The luxe interiors have been carved straight out of a magazine with stunning floor-to-ceiling bay windows, muted earth-tone colours, major wooden interiors, and rich, black shelves. The entrance is where you also have the library with a vast collection of books that you can read while enjoying the view and a pool table. This glass-enclosed room is sunny and bright for a warm and relaxed afternoon. Comfortable seating is also found in the living area that is located at pool level with a plush, velvet sofa, modern chairs, edgy side tables, and soft carpets on the floor. A 75-inch TV with NETFLIX is pre-installed in the room with surround sound. You have an unhindered view of the pool, bay area, and the sea. There is another dining table indoors with seating for 12 guests for memorable and delicious meals with friends and family. The fully-equipped kitchen is a true vision with state of the art fittings and appliances such as the induction cooktop, Nespresso machine, in-built microwave/oven, and others. The entire space is air-conditioned so you can enjoy the view without feeling too hot under the tropical sun. Guests of Villa Assava are in for a treat since the villa is not your run of the mill holiday home. It features many amazing amenities such as a Thai kitchen and a European restaurant on the estate. There is a fitness room and a games room for your enjoyment as well. The services are exceptional with 24-hour security and guest experience service. Nestled in a relatively serene part of Phuket, at a convenient distance from the beaches, restaurants, and other traveller-friendly places, the villa offers you a taste of both the bustling part of town and the serene part of town. 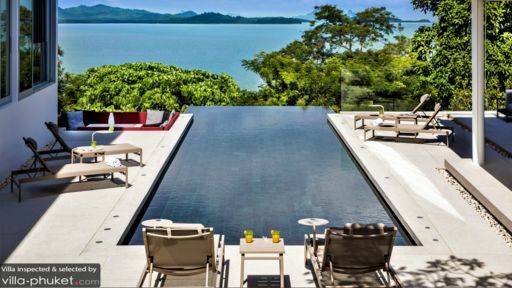 Baan Yamu is a gated estate for added privacy and you have beaches such as Surin beach and Bang Tao beach within a 30-minute radius.